I’m not smiling because that way you can’t see my dead tooth. I’m working on a new photo face. 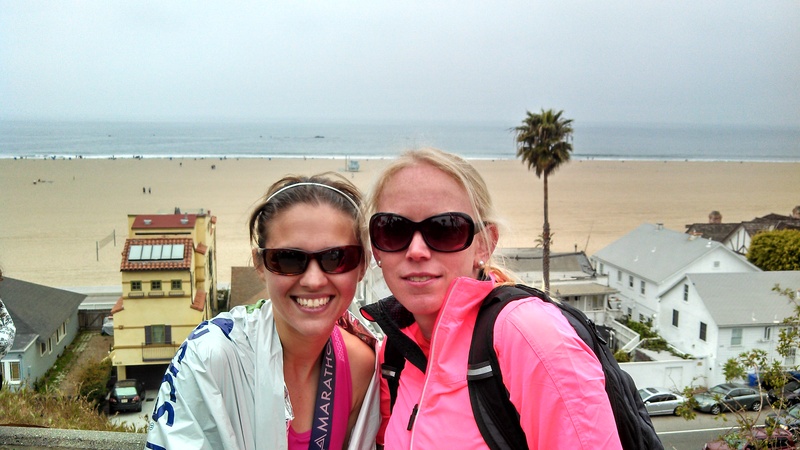 In the end, I did not run any part of the Los Angeles Marathon. Yesterday, I couldn’t even run two minutes without throbbing pain at the base of my toe. Oddly, running without shoes back and forth in the yard didn’t hurt my foot, so I briefly considered doing my runs barefoot, then decided even if that was my thing (and I wasn’t worried about stepping on lots of glass and feces in the streets of LA) I couldn’t really start doing that as a long run randomly. Natalie did, however, do the race, even though she’s been hurt the last four weeks and hasn’t run in three. We weren’t sure how it was going to go considering, so finishing is definitely a victory! Especially when you run it without being able to bend your left knee, like she did. The Expo: Who cares about the expo? You should be back at your hotel with your feet up anyway. They had what expos should have. The Goodies: They gave everyone a race shirt I’d actually wear that was fun and bright green. Though you didn’t get anything else in the goodie bag, unlike the 10K where I got a jar of “peanut butter.” And, the people who pay attention to these kinds of things also informed me the medal was cute. 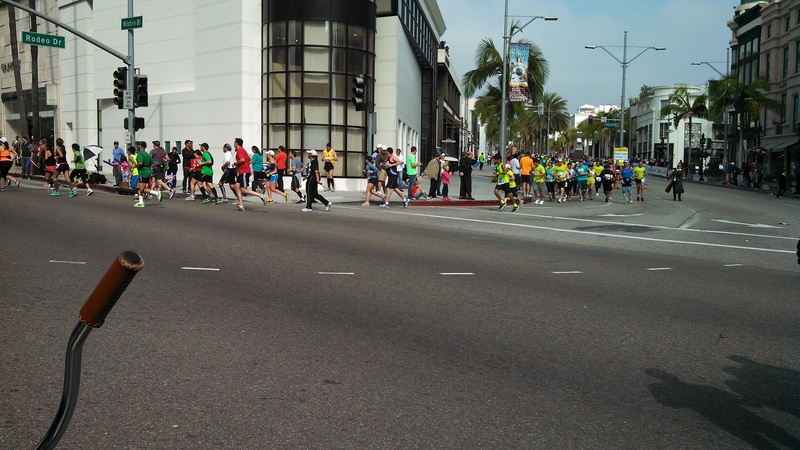 The Course: I’d say the best part of the LA Marathon is the course. It goes from Dodger Stadium (but not actually on the field) to Santa Monica via lots and lots of landmarks. You run down Rodeo Drive and along the beach and through Hollywood. I don’t typically pay attention to landmarks or vistas, but it’s a pretty flat (with a few rolling hills) course without being boring — and isn’t that what we all want. There’s also a decent amount of entertainment and cheering and community support. I’d say it’s not the most I’ve ever seen, but not the least either. There was a community pop-up beer station and sushi station and chili cheesedog station. There was also a lot of TV cameras and people trying to interview runners while they were running. Very LA. Miles 20-25 looked like they were pretty dead, which can be rough when you’re like shuffling and dragging. And, they didn’t have tons of amounts of food — I always hate when the only nutrition station is like at mile 20; newsflash: that’s too late! — but they had lots of water and drinks and aid/medical stations. Most importantly, they didn’t run out. The Organization: Sort of a shitshow. Now the caveat is that I don’t watch a lot of marathons and, to a degree, they all are sort of shitshows for spectators. And, to a degree, that’s fine, because the important thing is that it’s not a shitshow for the participants. The biggest problem is that LA doesn’t have great public transit, which isn’t the race organizers’ fault, but it means a lot of people had to drive a lot of places. And, the major roads were shut down, but without clear directions for alternatives or traffic control to make it run smoothly, so there was lots of sitting in traffic or trying to bike through traffic if you were me or being yelled at by traffic cops. And, then once you did get down past the finish to find your runner (where there was no cell service, as a side note), you had to make your way through this whole other shitshow and the runners had to walk and walk and walk to get to anywhere where they could get home. It wasn’t smooth. And, the drunken St. Patrick’s revelers did not make it any smoother. Runners coming around the corner of Rodeo. With this really annoying blaring video message thing behind me. Another funny, great post. And by the way, I had a dead tooth fixed 20 years ago and it’s still there. Worth checking out. They just yank out the old one and put a new one in. A fake one. So smile. Funny term btw: shitshow.